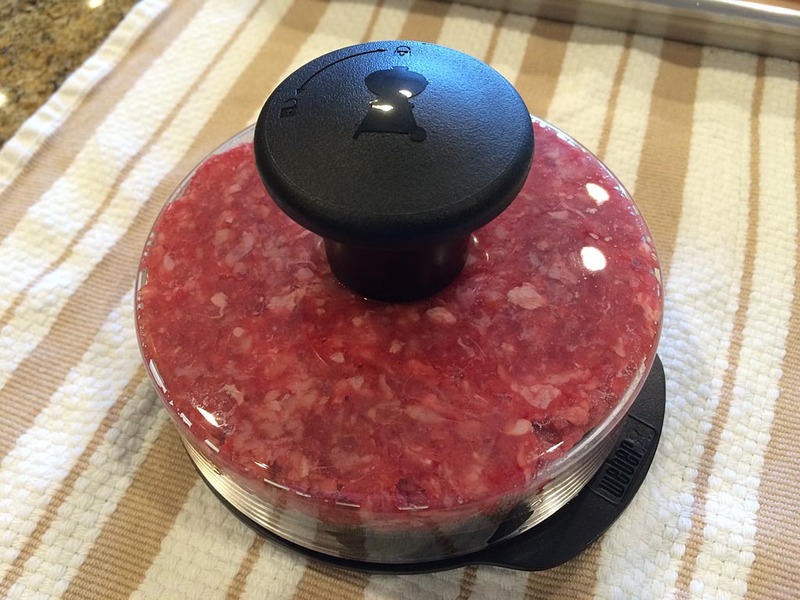 I’ve formed hamburger patties by hand for years and never given much thought to doing it any other way until I recently purchased the Weber 6483 Burger Press. The press consists of two plastic halves that form a 4-5/8″ wide patty. The bottom half is marked “1/4 LB” on one side and “1/2 LB” on the other; the offset design allows the top half to press down only far enough to make each sized patty. To make patties, flip the bottom half of the press to the patty size you want to make. 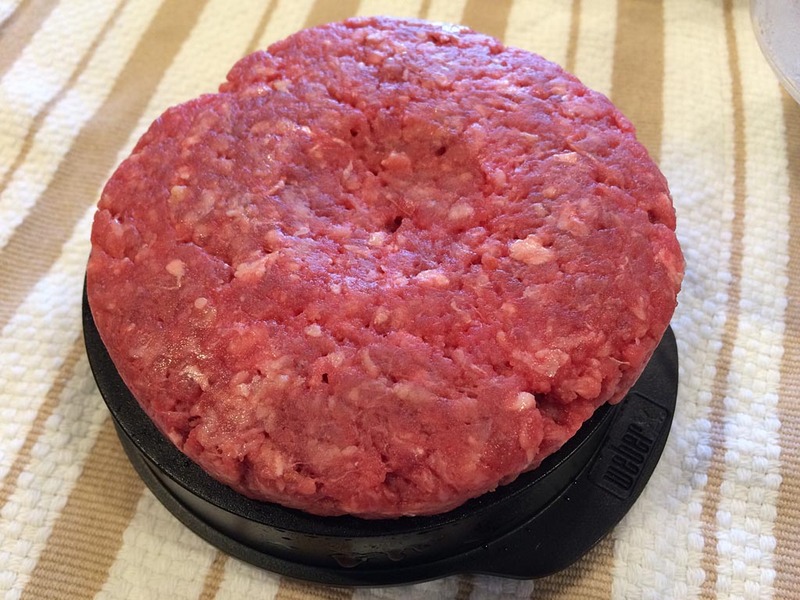 To make 1/3 pound burgers as shown here, use the “1/4 LB” side of the press. 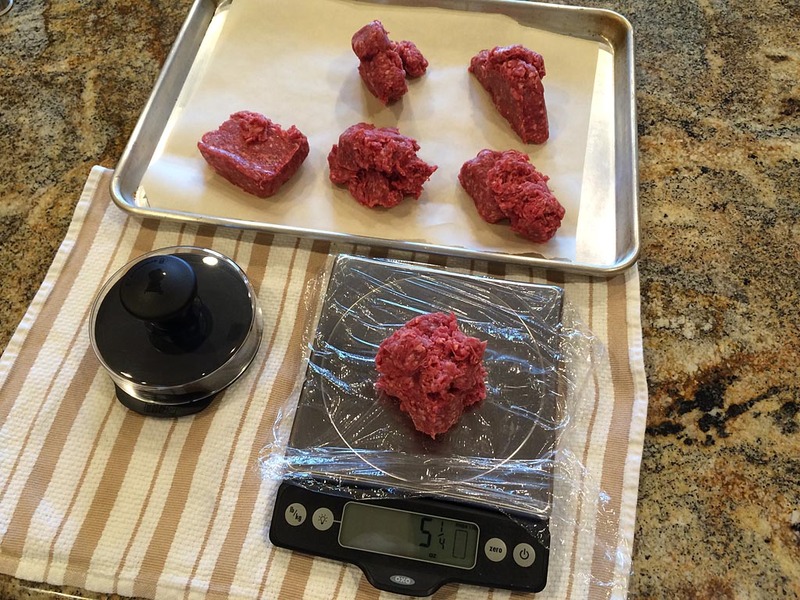 Use a kitchen scale to weigh-out the amount of meat for each patty, or divide the meat evenly by eyeballing it. 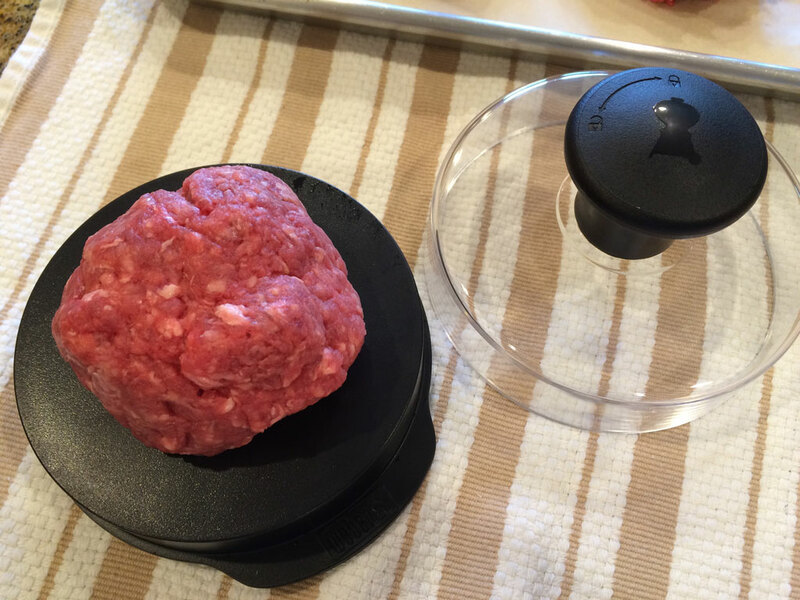 Form the meat loosely into a ball and place it on the bottom half of the press. Place the top half of the press over the meat and press down firmly. The clear acrylic allows you see when the meat has completely spread out to fill the press. 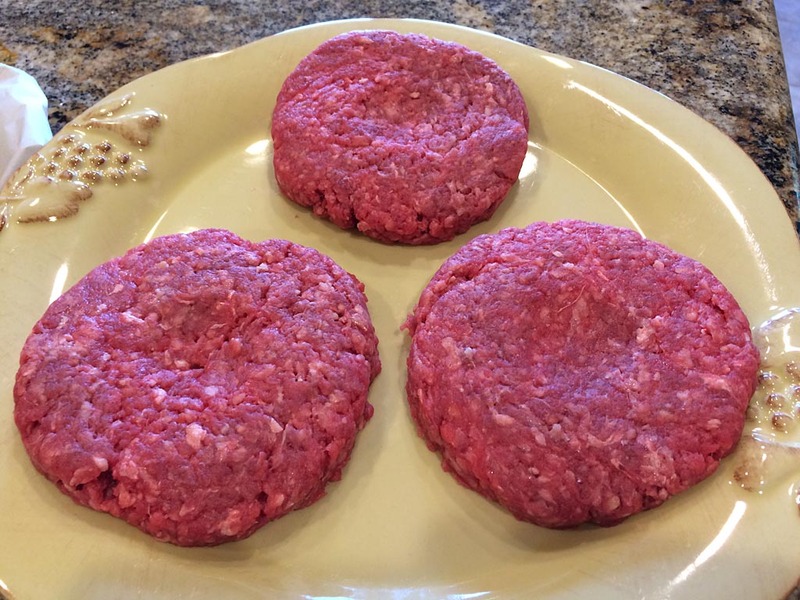 Removing the top half reveals that the press makes a dimple in the patty. This indentation helps prevent the burger from puffing up in the middle as it cooks. 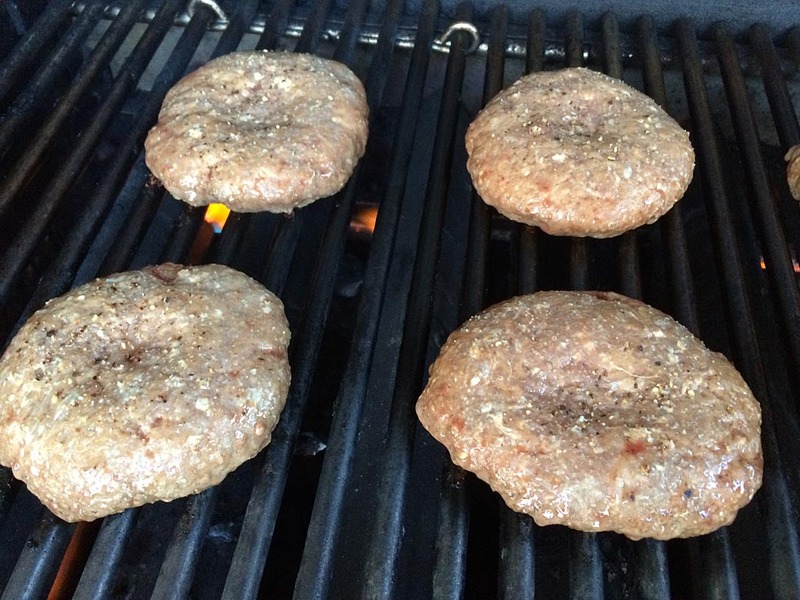 With the burgers pressed, they’re ready to be seasoned with salt & pepper and grilled. 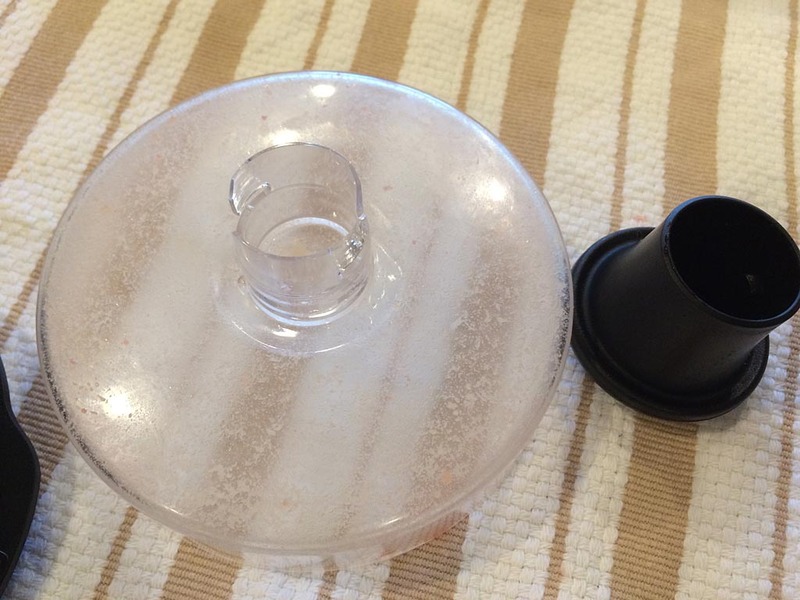 The nylon handle can be removed for cleaning. The burger press parts are labeled “dishwasher safe” on the box. 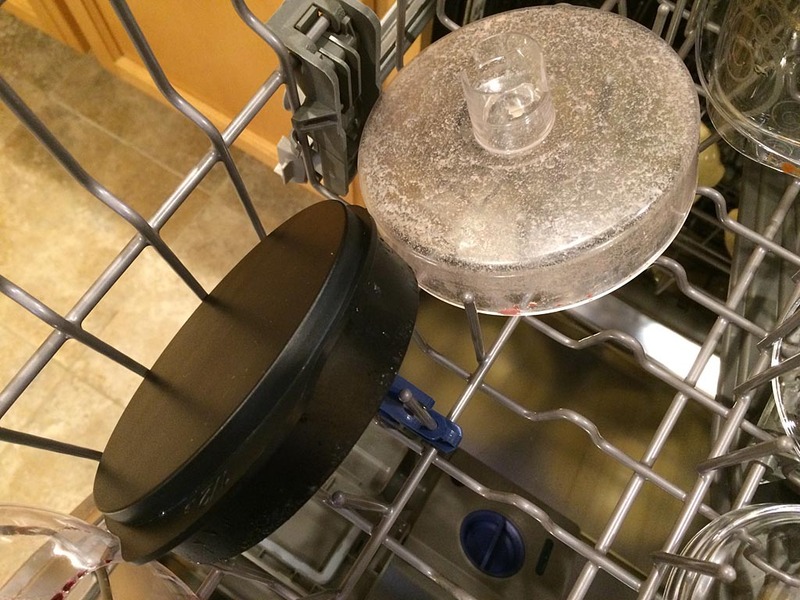 Since the handle was not dirty and is removable, I took it off before running the press through the dishwasher. Now just grill your pressed burgers as you would any other. I grilled these over medium-high heat for 8-10 minutes until 135-140°F for medium doneness. 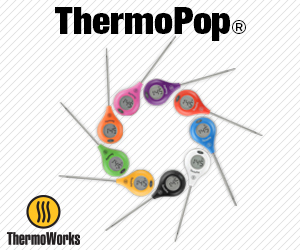 If you’re concerned about the food safety of your burgers, grill to 160°F for well done. 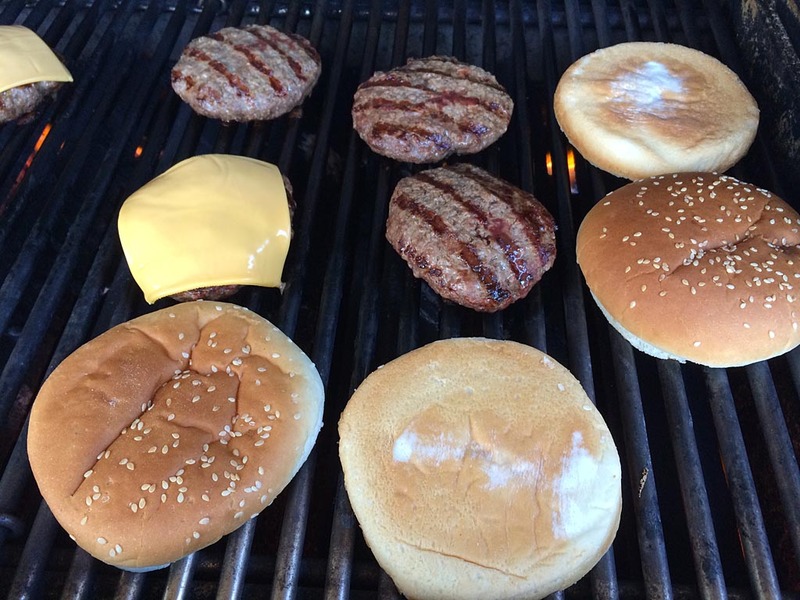 Note how the burgers grilled up nice and flat, not puffy, due to the dimples made by the press. Some people using this press report problems with the meat sticking to the press. I didn’t have a sticking problem, but if you do, a little non-stick cooking spray may do the trick. 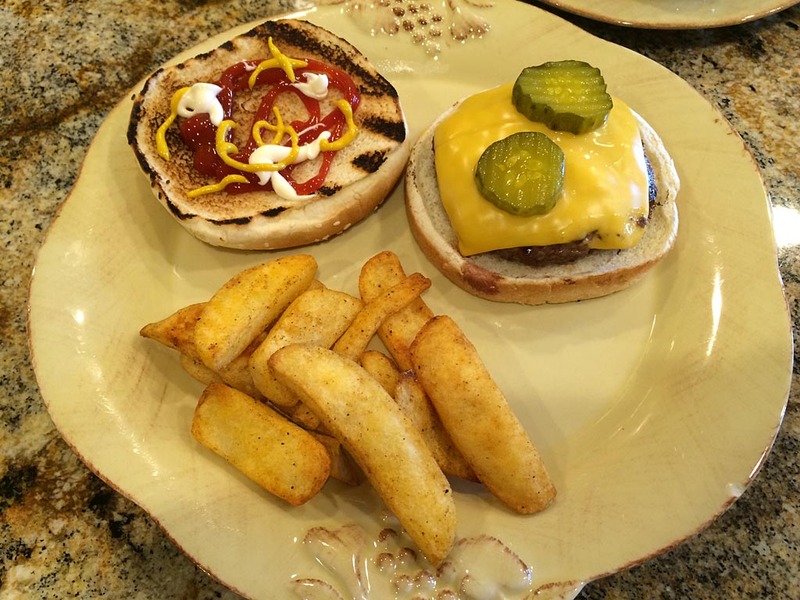 Some suggest using a square of waxed paper or hamburger patty papers to avoid sticking. 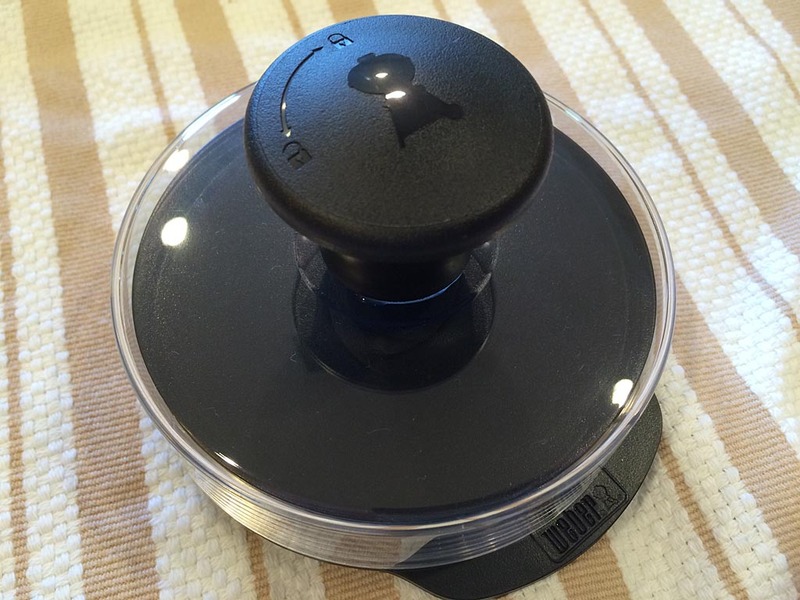 Overall, this is a neat gadget that I plan to keep around. 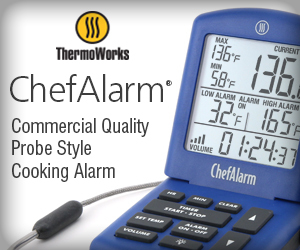 It works as advertised, pressing out consistently sized and shaped burgers that grill evenly every time. What to make sliders? Weber has you covered with the Weber 6485 Slider Press. For tips on making better burgers, read 5 Steps to Burger Brilliance, an excerpt from Weber’s Big Book of Burgers by author Jamie Purviance. 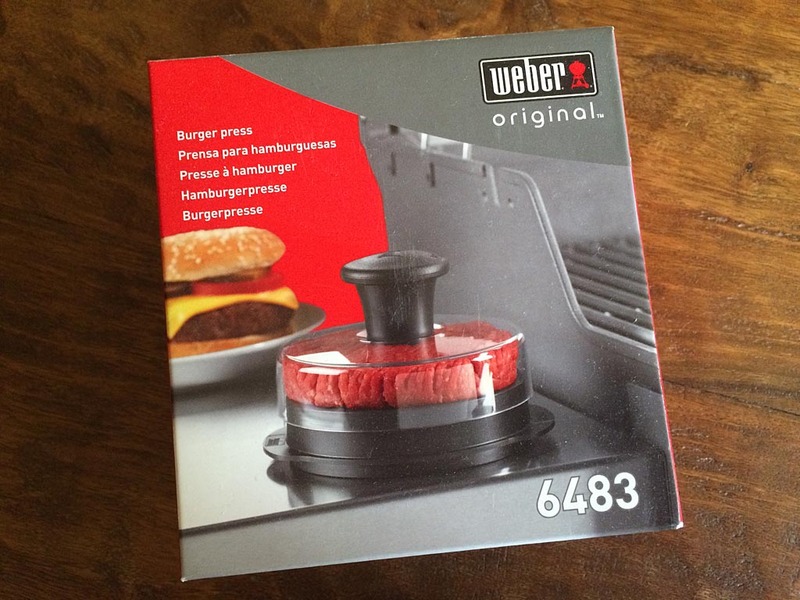 The Weber 6483 Burger Press is available at Amazon.com.